HomeSaudi Arabia- Over Seven Hundred Dead in Hajj Calamity. Saudi Arabia- Over Seven Hundred Dead in Hajj Calamity. Saudi Arabia faces second major disaster in weeks. At least 717 people have died during the commemoration of Eid al Adha in the town of Mina just East of Mecca after some of the 2 million pilgrims performing the Hajj pilgrimage were crushed to death in a stampede. Mina is the site the mass stoning the devil ritual reenacting the actions of the Prophet Abraham takes place on the day of Eid al Adha at the end of the pilgrimage. There have been many similar disasters during this day of the Hajj ceremony previously. The latest disaster follows the deaths of more than one hundred people last week when a crane collapsed in the vicinity of the Grand Mosque in Mecca. The annual pilgrimage is a huge boon to the Saudi economy and the House of Saud gains a great deal of prestige from the event that due to it’s scale and intensity provides unique challenges that the House of Saud have proven are beyond their capabilities. In 1990 more than 1400 pilgrims died in similar circumstances at the same point on the day of Eid al Adha. It is being reported that at least 43 Iranian pilgrims are among the dead and the Iranian Government is already offering severe criticism of Saudi Arabia. The Saudi Health Minister Khaled al-Falih for his part has sought to blame the pilgrims for the calamity, claiming that if the pilgrims had “followed instructions” the disaster would not have happened. 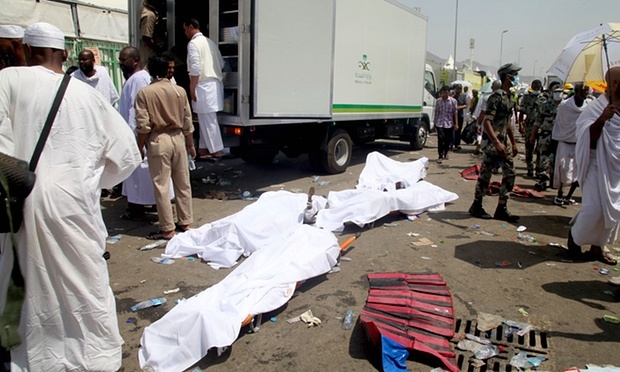 The bodies of dead pilgrims await removal in Mina following the Hajj catastrophe. “The Saudi authorities say that 717 people have been killed and 850 injured in a crush during the annual hajj pilgrimage. Pilgrims from several different countries are reported to have died – no surprise given that foreigners make up around three-quarters of the 2million pilgrims on this year’s hajj. 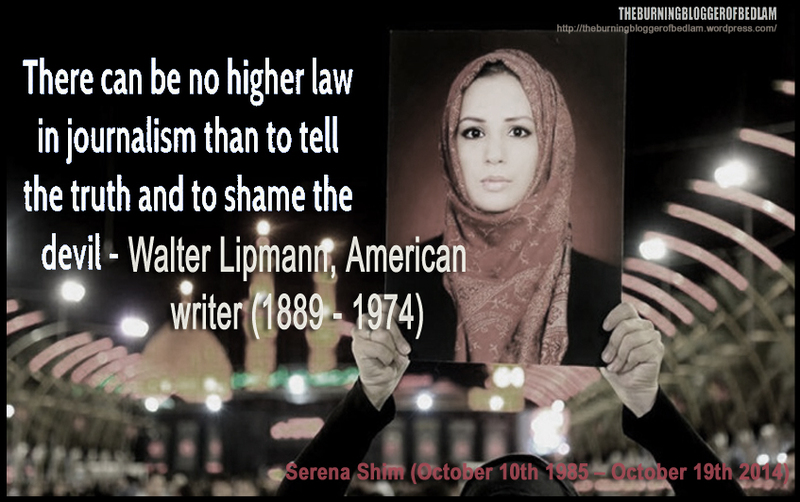 Iran said 43 of its citizens died in the stampede. It accused its bitter rival of safety errors in connection with the tragedy. More than 220 ambulances and 4,000 rescue workers have been sent to the location of the tragedy. The crush appears to have taken on a road between pilgrim camps. It happened on the first day of the Eid al-Adha festival, which marks the end of the hajj. Pilgrims travel toMina just outside Mecca throw pebbles at one of three walls representing Satan, in a symbolic “stoning of the devil”. Stampedes during the hajj have been a common occurrences in the past, although this is the first to lead to a major loss of life since 2006 and the worst since 1990. The Saudi authorities have made efforts to improve safety in recent years. It is situated 5 kilometers to the east of the Holy city of Makkah, and stands on the road from Makkahs city centre to the Hill of Arafat. Saudi King Shah Salman arrived at Mina after sad incident occurred on Thursday in which at least 240 pilgrims embraced martyrdom. Saudi King Salman visited arrived at Mina and monitored the ongoing rescue operation. According to details, more than 4000 rescue personnel are busy in operation. Earlier, on September 2015, another incident of crane crash in Masjid al Haram (Grand Mosque) left 108 martyred and more than 200 injured. Thanks for that, there may be much more to the story of the Hajj tragedy. Thanks for comment Abdul, unfortunately I cannot understand what you were trying to say there.